Choosing a KVM can be very difficult. Every aspect of your computer interaction goes through this one device, and the slightest issues with the device can become major irritants. Having to live with a troublesome Belkin KVM at work, I know all too well what trouble these devices can be. 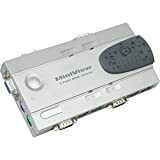 I bought the SVIEW04 to replace an older Linksys PS2KVM2 which I've used at home for the last several years. With the addition a new Mac Mini to join my current Windows and Linux PCs, I needed to upgrade to a larger KVM. I had been extremely happy with the PS2KVM2 (perfect image quality, instant switching, no mouse/keyboard problems or spurious character and mouse clicks when switching), so I stuck with the Linksys brand for this new one. I am mostly pleased. It continues to emulate the mouse and keyboard perfectly (something I can't say about the Belkin KVM I use at work). With the addition of a PS2->USB adaptor it also works great with the Macintosh. Linux presented no difficulties either (the Belkin PS/2 KVM I've used has never played politely with Linux due to shoddy mouse emulation). The keyboard shortcuts are unintrusive, even for a programmer making heavy use of emacs and its carnival of bizarre keyboard shortcuts. Even better, dip switches allow some limited control over the keyboard switching (selection of alternate shortcuts, enable/disable 'quick' switching via the control keys). My only complaint about this KVM is the video quality. I hooked it up using the same cabling which gave me a perfect image with my old KVM, but the output from the SVIEW04 is not as good. It causes a slight ghosting effect which makes objects look faintly embossed. This is particularly distracting for text on other backgrounds other than white. Note that I run my display at 1600x1200, and people running at lower resolutions will find the effect much less noticable. It is disappointing that the signal quality of newer Linksys KVMs seems to have diminished. Aside from the video quality issue, this is a great product. I'm giving it 3 stars due to the video quality, otherwise it would receive a full 5 stars. Linksys provides one of the best, versatile, and easy to use console switches on the market.I've used others that cost less, but broke only weeks later.The first one I got 3 years ago is still working. 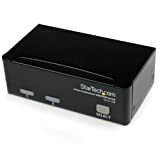 This is an easy way to share a monitor, keyboard, and mouse with multiple CPUs.The device allows either keyboard enabled or hardware buttons to switch between systems.New systems can be added without creating new problems.Just plug and play. Connects 4 USB computers and shares 4USB peripherals. Enhanced functionality. Free lifetime technicalsupport & pre/post project consultation.- Peace of mind. 19" Rack-Mountable with optional rack-mount kit. Cross-platform compatibleUSB KVM switch with MAC and Windows systems. Unit is very solid with very nice cables and straps. 2. One of the 4 cables I got was a mfg. dud. The female video into male kvm is out of wack and does not fit. (Working on RMA with mfg. about this: they seem to doubt one. Apparently no one is as technical as they). The best KVM I've ever seen! This is absolutely without a doubt, the best KVM switch I've seen. It takes about 2-3 seconds for XP to recognize the keyboard and mouse however this isn't a major problem. What I do like is that because it's a USB KVM and not a PS/2 version, you can boot a PC while never actually switching to that PC to do so (which is something that really limited all manually switched PS/2 KVMs). I would definately recommend picking up this item. I purchased this to switch between my PC and a new mini Mac. The cords are premium quality and come with velco snaps, which really impressed me. They didn't have to do that (no one else does), and that demonstrates how committed they are to little details. Also, having buttons to switch between computers is essential. I DO NOT recommend any KVM that relies on "hot-keys" whatsoever; I speak from experience. Again, I *STRONGLY* advice against buying any KVM that relies on "hot-keys" rather than providing actual buttons on the unit. The USB on the Mac is immediate; the mouse is active as soon as I switch, which really surprised me. It takes about 5-10 seconds on my PC (Windows XP), but that's acceptable. Also, having the extra USB ports is nice because I can share my USB printer/scanner between both computers. Speaking of which... Every so often, when I switch back to my PC, it decides to "re-recognize" the printer -- you can see the "New Hardware Found" dialogue pop up in the system tray -- which also automatically sets this printer as my default printer. This is HIGHLY annoying, as I don't realize what happened until I send a document to be printed and it starts printing in my color printer. Like I said, this probably has nothing to do with the KVM, just FYI. There is a noticeable difference. It's like the difference between aliased and non-aliased text, i.e. the text is just a bit blurry. You may not notice for lower resolutions like 800x600 or possibly 1024. I was able to change my monitor settings so that the display for one PC was perfect, but then my Mac displays a bit blurry. If crisp video is not essential, this is a great choice. I've tried MANY models, and so far this is the best. And, like I said, since I haven't been able to find a KVM that didn't reduce video quality, I can't really fault this one too much. FYI, I received a black unit even though the Amazon picture is white, which I prefer anyway. This is a great unit and I am very happy with it, although its operation is not flawless (I think largely due to Microsoft bugs). With my Windows 2000 computers, it works almost flawlessly. When I switch to the computer, it takes about 5-10 seconds to recognize that the USB connection is now active, and I have had absolutely no problems with it. When I first tried using it with Windows XP, the XP computer would not recogize the keyboard or mouse when I switched back if the computer was allowed to go into stand-by mode (which I often use). After a lot of tweaking, I discovered that if you find the mouse driver, click on the "Power settings", and disable the button that allows the mouse to wake up the computer from stand-by, then the problem went away. Now, the unit is working almost flawlessly. However, about once a week or so, the stupid XP computer still seems to have problems recognizing the mouse. When this happens, there seems to be nothing I can do to get it to accept the mouse and keyboard. At this point, the only thing I can do is plug in a second mouse into a spare USB port, shut down the computer, and reboot. Somewhat inconvenient, but it doesn't happen too often. This switch is awesome. I have both a SUSE LINUX 9.3 box as well as a Windows XP machine. I turned off both machines. Plugged in my USB keyboard and mouse and then turned both machines back on (one at a time while the switch is on it's corosponding postion) and bammm! It worked with no configuration or anything. I'm very pleased and very impressed. On anothern note, the switch is not some cheap plastic thing, it's heavey and has some weight to it so it does not slide around on your desktop. It's made with some quality. Also. there is a 3rd USB port on the back, you could share an additional device if you wanted such as a USB web cam or something. 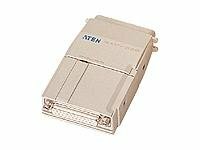 I have been pulling my hair out off and on for two years with KVM switches that don't work or - worse yet - only work sometimes (mostly IOGear). THIS KVM SWITCH WORKS. I have a specialized keyboard and mouse and both work flawlessly ALL THE TIME on two different computers. It is worth every penny. Works right out of the box. I tried Belkin switch, but had considerable video distortion. ConnectPRO works great - no video problems at all. Sure, Belkin switch looks better, but all I care about is how it works and this one is a clear winner. I have a Mac and a PC, a logitech usb keyboard and mouse, and a Dell 20 Ultrasharp monitor with a native resolution of 1600x1200. Both the Mac and PC work perfectly with this switch.All special function keys of the Logitech keyboard work in both computers.My mouse has 7 or 8 buttons and they all work in both computers as well. The only problem I've noticed with this switch is the video at 1600x1200.As another reviewer stated, at this resolution there is ghosting.In particular, when I'm on the PC, I have two barely noticeable darker lines moving across the screen from right to left.When I switch to the Mac, the two dark lines move from left to right.It's not too terribly distracting, especially if you have a dark desktop background. I'm thinking of trying the 4 port version of this switch and seeing if the ghosting will continue with the Mac on port 4 and the PC on port 1.I'm hoping that if the two computers are separated a bit more than they are on this 2 port switch, the ghosting will disappear. However, this 2 port switch is still the best I've seen so far.It's simple to set up, the case is heavy duty metal (even though the switch is roughly the size of two decks of cards, it feels heavy and extremely durable), and it simply works.If you use a lower resolution than 1600x1200, then you should be fine with the ghosting issue. I decided to try it out. It basically lives up to it's promise. Switching between machines (one Linux and one Windows) is quick and neither complains. The only issue I've found is that when driving the display at 1600x1200x85Hz there's some noticable ghosting (to me at least). Lower resolutions don't exhibit any ghosting. I tried using other high-quality video cables I had from a previous KVM but the ghosting persisted. The cables and previous KVM didn't have any ghosting. Tired of fumbling with plugs and wires when you want to use your headset instead of your speakers? Plantronics has a new addition to the .Audio line of Analog PC Headsets, Microphones and Accessories. The .Audio PC Headset Speaker Switch offers a convenient desktop solution that allows you to easily switch between your speakers and headset at the touch of a button. One-time installation takes only seconds. Plug it into the sound card and add dual functionality between the speakers and headset. 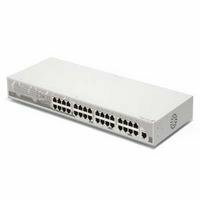 Despite being a little bigger than I would like and its somewhat "clunky looking" appearance this is a rock solid switch. I have used this item for about 18 months and I am stunned at how well it continues to hold up.The switch is every bit as solid as the day I bought it and has withstood several switches per hour as I jump from online gaming to listening to music. I would request that it have been a little smaller BUT,it has held up so well I would hardly dare to criticize any elements of its design.It has outlasted 2 sets of headphones and has been stepped on and rolled over far too mant times without any effects. I would like to request a 5.1 model for future release. 4.5 stars round up to five. This device can also be used with any audio unit (for example, a portable CD player) that has a mini-plug output jack--enabling you to switch from headphones to, say, amplified speakers, without the aggravating ritual of removing one plug from the playback unit and inserting the other (and wearing out the jack in the process); and at the computer, it can be used for instantly switching from those typically weak (but often useful) built-in monitor speakers to more powerful desktop speakers, as source material and circumstances demand. (Of course, you'll need one switch for each such arrangement.) A marvelously simple and simply marvelous device, with more uses than Plantronics chooses to advertise. Great product, but with one glaring discrepancy:The microphone port is disabled when the switch is set to speaker output.This assumes the user won't use a microphone simultaneously with speakers, which in fact I do quite often.Other than that, a very handy device. Everything seemed to hook up fine, but I only had one speaker working when I tested the unit. At first I thought it was just a loose wire, but after checking everything I was about to give up. I had to unconnect everything and went back to my old setup but... I ended up with the same problem, one speaker working. I had to reinstall my sound card and then the PC Speaker Headset Switch worked fine. I'm not sure if the unit any thing to to do with my sound card messing up, but oh well. After all this the Switch box works great and the audio sounds perfect. Besides the fact you have to buy the cables separately as others have mentioned, Belkin support is horrible. The automated system consistenly disconnects the call, requiring going through their operator. My 4-port KVM stopped functioning after six months. There's no information on the web to help either. It's as if there IS no way to fix a KVM that doesn't work. Flash upgrading is a joke. I followed the procedure directly from Belkin's website. So I had to RMA replace it. Trust me, Belkin doesn't care about its customers and arrogance will be their downfall. Go with IOGEAR - they include all the cables with the KVM switch for the price of Belkin's without cables. I'm evaluating the DVI version.The cables are sold seperately, so what's the point to buy a KVM without cables?!? Lastly, hearing the problems doesn't surprise me, as working with the two port version, I had some problems where computers becames unresponsive. What idiot designed this trash. 1) It is nearly impossible to connect a cable to the console DVI Connector. Belkin had to overnight a special extender to connect the monitor DVI cable to the KVM. 2) Connecting the Power Adapter to the KVM blocks one of the peripheral USB ports. 3) It's absolutely impossible to put on the cover (i.e. cable management cover) if you connect the four (Belkin) cables to it. 6) There isn't a FAQ or software/firmware upgrade listed for this device. I would recommend checking out the belkin support pages or lack there of. I bought this over a year ago, and am very pleased with it. It was easy to set up, and works well with all my Windows XP Pro boxes.Switching between PCs is fast enough, with only about a second delay (typical of KVMs in general) to restore the mouse pointer.Once locked to a particular PC, the KVM is very stable.I've had no problems with either the video display or keyboard/mouse functionality on any of my Windows-based systems and can play games as well as perform all normal office-type tasks with no noticable performance degradation. The only issue I have is with losing mouse control when switching to my Red Hat 9.0 server running X (not a big deal since I primarily access the terminal from the command line on remote anyway).There is no issue when I boot up the Linux box and use the KVM without switching to another workstation.I suspect the problem may be fixable, but it has never been enough of an issue for me to pursue it, given my needs. The unit has the unique ability to support stereo audio as well as firmware upgrades.In addition, the cable management is cleverly built in to the sleek housing as opposed to completely exposed as in most square footprint KVMs, thus saving a small amount of desktop space. Overall, in my experience, the Omniview has been a good KVM for the money. Share a printer or any USB devicewith up to four computers using the Belkin 4-Port USB Switch. 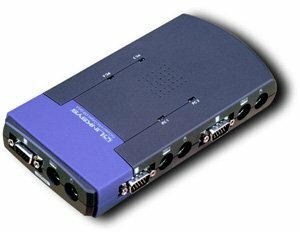 Four downstream ports let you connect up to four USB computers. 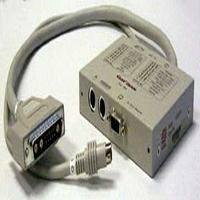 An upstream port can connect with just about any peripheral. Share a printer, scanner, or hard drive by pushing the Selector Button on the front of the switch. The selected computer becomes the active computer, and you can access the peripheral. Want to share multiple peripherals with up to four computers? To use more than one peripheral, connect a Belkin 4-Port USB Hub to the switch and then connect additional USB devices to the Hub. The selected computer can access the peripherals youve connected. For your maximum convenience, the switch works with either USB-enabled PCs or Mac computers, or a combination of both. The Belkin 4-Port USB Switch is the ideal solution for sharing a printer or any USB device, with up to four USB computers as well as, share multiple peripherals with up to four USB computers. The Linksys ProConnect four-port compact KVM switch allows you to instantly toggle between four PS/2-equipped desktop or notebook PCs while using a single monitor, PS/2 keyboard, and PS/2 mouse. Ready to run directly out of the box, the switch is compatible with all major desktop and notebook computers, requires no software, and eliminates cable swapping. From a functional standpoint, this is one of the best "non-industrial" KVM switches I've used.Switches between multiple OS's (W2K/XP/Linux) with no issues.Seems perfectly happy with both my antique IBM keyboard and my brand new Logitech wireless mouse (with USB->PS2 adapter and the standard number of buttons).Ergonomically, it could be better, though.As other reviewers have noted, cables attach to this puppy on 3 of 4 sides.When set up with the max of 4 machines, it has 15 cables attached to it.Since it weighs all of a half-pound, it's pretty much sitting where ever the cables want it to be, not where you want it to be.I was able to get it to stay where I want it without an utter mess by careful routing of cables and use of lots of cable ties.Also, again because of the light weight of the device, you need to hold it in place while depressing the selector button, or it tends to walk away from you.And finally, I'm not a fan of the hotkey combination required to activate the device: Alt, Ctrl, Shift, PC#(1-4), Enter.Five keystrokes - you've gotta be joking!I'm a much bigger fan of the Belkin way (ScrlLk, ScrlLk, Up/Down).Pity their current products are so dicey. This is a very simple KVM. Lacking the fancy bells and whistles of the more expensive untis, this one does it's basic tasks. 2) Home built Linux computer with all brand new parts(1week old). 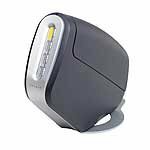 Mouse: COMP USA branded PS2 optical Mouse. Right out of the box I started having problems.I would loose the signal from the Keyboard and Mouse.I would be able to switch between computers two or three time, and then I would loose the mouse and meyboard signal.After a lot of troubleshooting and just short of sending it back I replaced the new Keyboard with my oldest PS2 keyboard, that originally came with the Dimension 4100, and all of a sudden all my problems went away.Evidentally this KVM does not like the new Dell Keyboard. I've been using the old keyboard for a day and so far so good. The picture quality on my 2001FP monitor seems sharp on with all three computers.I do not perceive a loss in picture quality. I purchased this instead of the Belkin soley on name recognition and good past exeriences with Linksys routers. Unfortunately, their good name doesn't transfer to their other product lines.First, the video cables were M-F rather than M-M like most other switches so I had to buy new cables just for this thing.Second, after hooking up all the cables, I see how awkward it is to place this on a desktop with cables sticking out in 3 different directions (same complaint as another reveiwer).Third, the switch's hot keys would not switch between computers - instead, it would just rotate my screen 90-180 degrees!Forth, I called Linksys support and after about 5 "please wait while I look something up" I got transferred to their sales department and they said I had to buy their cables.After I told them that was unacceptable, they offered to sell me a new router...Ugh!I'm returning this POS as soon as possible. I bought both the linksys and belkin 4-port kvm products. On the linksys, I had problems with mice being recognized and having mouse clicks missed. On bootup, I could not have my laptop attached if it was not on port 1, since it would then think the mouse was not attached no matter what mouse or trackball I used. I have none of these problems with the Belkin product. Also, from an ergonomic point of view, the belkinproduct is set up much better, with the cables all attaching from the back (except the console mouse/keyboard cables). Also, the belkin product is less expensive. I've had this device for years now.I purchased it to share a keyboard, monitor and mouse between a newly purchased Mac and my PC.It does exactly that.I plugged in my USB keyboard and mouse, plugged in the monitor, and it works great! 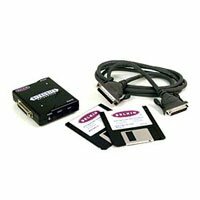 I've used this with Windows, Linux and Mac OS 9/X with a range of USB devices, and never had any problems.IOGear makes good reliable KVMs that come with cable sets (although I did have to purchase 1 longer cable, to reach a 3rd computer). I never experienced any video issues, things looked crsip and clear. One potential "gotcha" is that this is a true switch.When you switch to the next computer, it "disconnects" the USB devices from the computer you just switched away from, and connects them to the computer you just switched to.This gives you the ability to switch lots of USB devices between machines, but introduces a few seconds of "lag" when you switch, as the computer has to detect the new USB devices. If you want USB keyboard emulation, so there's not that "switch lag", there's other USB KVMs out there that do USB "sniffing". Overall, I've been really happy with mine.Years later, it's still going strong. I have been using this KVM switch for years. Very well build. No problems under Windows 2000 and Windows XP. I did try variety of USB devices connected to the HUB such as: Scanners (HP & CardScan), Keyboards (Microsoft and GoldTouch), Hard drives, Cameras (Logitech), and a Cannon Printer. I never had any issues. The only negative is that the switch can not be controlled from the keyboard. 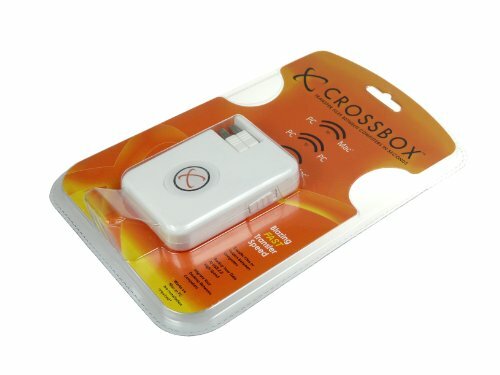 Bought this product to use with my MS Internet Keyboard which is a PS-2 keyboard (with a usb adapter).No matter how many times I attached the keyboard to the USB of the miniview, it would not detect it as an Internet Keyboard.Only as a HID Keyboard Device.This prevented me from using the shortcut buttons at the top of the keyboard. Also, when going into games, never of the keyboard keys would work which is strange.I even d/l the latest drivers from MS to get it to work and it still would not respond inside of games.But the keyboard keys work in stuff like Word and Visual Studio. I use it to switch keyboard/video/mouse between two systems, but it's pretty flaky.Sometimes you have to hit the button several times to get it to switch, and since it takes several seconds for the switch to take effect, you have to click ... move the mouse around and wait to see if it worked ... click ... move the mouse around and wait to see if it worked ... etc.Annoying.It works okay except for that, but it's also on the expensive side.There's got to be something better out there. I bought this KVM a few weeks ago after scouring the web for USB KVM boxes.This was one of the few out there that qualified.The reason I needed a USB switch was for my wife's computer, which is an Apple Power Mac G4.The other computer hooked up to it is a clone Pentium 3 system.So far, we have not had any problems with the unit.In general, we tend to put the Apple in sleep mode when we shut in down rather then power it off altogether.When we switch back to the Apple after using the PC for a while, the Apple automatically turns on without having to wake it up.On the PC side, I am running Windows XP, and I normally shut it down in hibernation mode.Switching from the Apple to the PC, all I have to do is hit the power button, and I'm up and running with both the mouse and keyboard completely functional. One side note - I am using the Macintosh USB keyboard that came with the Power Mac, and the USB mouse is a Microsoft Optical.So far, both of these devices have worked great between the two computers.Also, we have an HP DeskJet printer which we share between the two computers, and I plugged the printer into one of the two USB slots that are on the front of the KVM.So far, it's worked great. Other then it being PC and MAC friendly, this is a great system if only for the fact that it comes complete with everything you need to set it up - no need to go out and buy more cables.The only drawback I could see is that you are limited to sharing the KVM between only two computers.But if what you are looking for is a good (and inexpensive) way to share one keyboard, mouse, and monitor with two computers (whether it is aMAC or PC), then this would be a sound solution for you. Good: comes with all the cables you need to setup a switch for two systems to share a monitor, USB keyboard and USB mouse. Reasonably priced.Small size.Supposedly has hot switch capability. Bad: Recognized desktop, but wouldn't recognize laptop and wouldn't switch between systems.Basically my primary system would work as long as it was the first and only system I used. As soon as I hit the switch it was time to shut down and reboot both systems. I'm a well-above average user and I tried everything I could think of to make it work, read the directions from the start, booted up separately to allow initialization, checked the knowledge base website. After several frustrating hours I returned it. I have a Mac and PC that I would manually switch cables between the one monitor. After much research I found this Iogear KVM switch. It is awesome. It comes with the cables you need to connect two computers to the one monitor. It is is so simple to use and it is such a tidy little unit that it takes up no room at all on your desktop. I am impressed enough with the ability to share a monitor between the Mac and PC (no more getting up and fiddling around with the back of the monitor) and the 4 USB ports that come with this unit are a bonus (sharing one USB keyboard and Mouse between two computers). I hooked up my Zio Smart Card Reader (USB) to the Iogear unit and instantly I was switching between the two platforms and they both were recognising the card. Computer 2:Sony Vaio PCG-R505 TSK with docking station. This laptop does not have any PS/2 port, only USB ports. So I had to buy a "USB to PS/2 adapter" for the keyboard & mouse. The adapter cost only $9 at Frys, so worked out great. Initially, I had use the Dell PS/2 keyboard as the main keyboard. But somehow, it didn't work.The keyboard functioned fine for Dell PC, but stopped working when I switched over to the Sony Vaio. Anyway, I then replaced it with the Keytronic's PS/2 keyboard, and everything worked! I was able to switch back and forth between the 2 computers using the hot key sequence: "ctrl-alt-shift, 1, enter" OR "ctrl-alt-shift, 2, enter". As for Video quality. I couldn't really tell whether there's a degradation or not. I had set my LCD to 1920 x 1200 and it seemed fine. Btw, the cables are pretty short. But it worked out fine for me since all the computers are congregated in one section of desk. But if you have computers far away from each other, you might have to buy extenders. It comes with all the cables you'll need for all 4 PCs and works perfectly.No problems at all.Plugged everything in and it just works without any degredation in performance or picture quality. 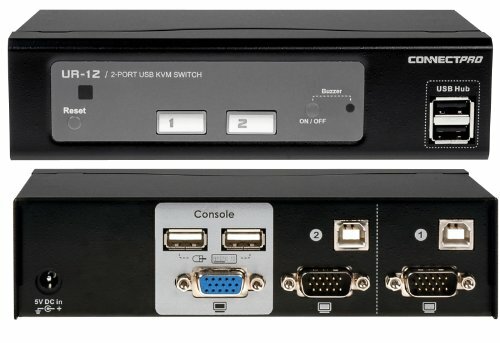 It might look a little cheap, but the fact is you are going to have 15 cables sticking out of the thing, so you're going to hide it if you have any sense at all, and so how it looks will make no difference.The whole point of a KVM switch is so that you can do your switching from a single keyboard. This is the one to buy if you have non-USB keyboards and mice.You plug your non-USB keyboard and mouse and your monitor into one set of plugs, then you use the included cables to connect the switch to the PCs you want to use (the PCs must have non-USB keyboard and mouse connections) and that's it.It draws power from the systems to which it is connected. Very inexpensive and quite decent. I have three machines hooked up to this box and, so far, it's performing no worse than the Belkin and other boxes I've used in the past.Since those vendors charge about as much for one set of cables as this entire unit costs, that makes it fairly impressive. The only complaint I might have so far is that the fit and finish of the box feels a bit sub-par.The case is a bit flimsy looking but, I suspect, as long as it's not abused, this won't impact functionality. Video shows absolutely NO noticeable degradation, which I couldn't say about the Belkins I've used.Switching works fine.My vanilla PS/2 keyboard and mouse work without incident. I'm going to try a USB mouse with a PS/2 adaptor just for grins.If it doesn't work, no big deal since the manufacturer made no promises.But I've heard stories of them working fine. I don't regret the purchase and I'd buy it again.It's a great deal. Returned to store. Does not work with wireless . I called Iogear after everything was set up, and they told me that this one doesnt work with wireless. I called back and asked what they suggest, and they said try GCS1732 or GSC1734, they should work with wireless. After my call, Im questioning the quality of Iogears tech support. Ofcouse the models that work with wireless are priced between 140 and 190. I think I will just have to pull my 17" CRT out of storage for a while. Until LCD prices come down a little. I recently bought this switch, in a package which includes 4 6-foot kvm cables, from another vendor, and I'm very happy with it. It works perfectly. Unlike one of the reviewers below, my USB Logitech mouse, connected via a PS/2 adapter, has absolutely no problems, neither with the buttons, nor wheel, nor scrolling. I suspect his mouse problem is due to the driver. I use the standard Microsoft PS/2 mouse driver. You don't necessarily need a "pure" PS/2 mouse, though the instructions indicate that serial to PS/2 will not work. The video quality is also great, no loss or distortion whatsoever. I was actually prepared to see some loss in video, so I was very pleasantly surprised. The keyboard works great too, as do the hot keys for switching ports. I even connected the mouse and monitor to a DOS machine that uses an older keyboard connection. So for that I have to swap keyboards. Nevertheless, the video and mouse still work fine. The OmniView All-In-One Pro Series Plus KVM Cable Kit is the easiest and neatest way to connect all your computers and servers to your KVM switches. These Cable Kits offer high-performance, high-quality, and reliability. The Pro Series Plus All-In-One Cable Kits feature nickel-plated connectors with a gray jacket and are great for high resolution applications. The OmniView All-In-One Pro Series Plus KVM Cable Kit cabling is the solution for hooking up one PS/2 computer to your OmniView KVM Switch. 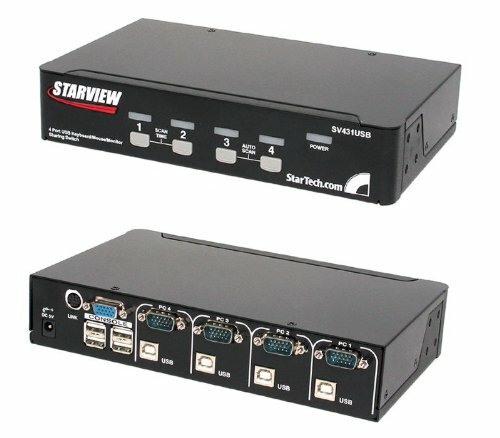 This KVM is advertised to work without a power supply under Mac and PC (as specified on the startech.com website) but doesn't. It has a 5v recepticle but doesn't even include a cheapo wall wart. The 5v voltage is not even common enough for Radio Shack to carry them so they are expecting a lot from the end user. The specific problem is I get a warning from my Macs about too much power being drawn and then the keyboad and/or mouse gets disabled. I have 2 differnt setups where it fails to work. One consists of a PowerMac G4 and a PowerBook G4 with a ViewSonic 20" monitor, Apple Pro keyboard, and Microsoft Optical Mouse. The other setup consists of a PowerBook G4, Old Micron Linux box, Sony 17" LCD, Apple Pro keyboard, and a Logitech Optical mouse. These seem like common configurations so I am wondering if it is defective or unrealistic about its power requirements. I have written startech.com about this issue. I will update this review once I get a response. Startech sent me the power adapter needed when connecting to Macs. BTW, its not included. Seems to work as advertised but I have noticed that if I don't switch to a Mac for an extended period it wont wakeup. This product is great. The picture quality on the monitor is excellent, even without a power adapter. This is the only switch I could find for under $100 that supports USB. Most switches in this price range only support PS/2 mouse/keyboard, but my printer is USB-only, so I needed a switch that supports USB. Startech also makes some cables ...that have monitor and USB bound together which I also bought. 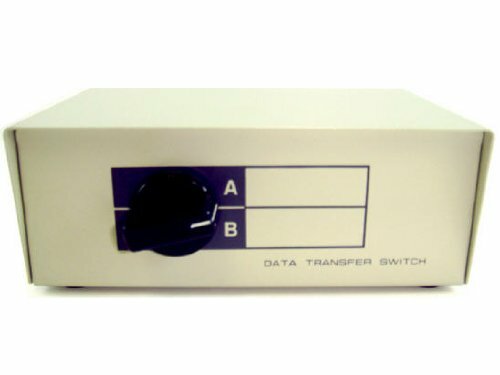 I use this switch for a desktop & a laptop. When I connect my laptop, I just need to plug in the monitor & USB, and I'm ready to go! It's so easy. I just wish it could control audio as well, though there's probably some USB device out there that you could plug into this switch. The cable setup was a snap and there were no drivers to install. My system recognized the devices automatically. On the down-side, my laptop (WinXP) is a little slow to recognize the mouse & keyboard when I switch to it. It usually takes about 3 seconds, but can be up to 20 seconds on occasion. Generally it's not long enough to bother me. The 2-port Bitronics AutoSwitch permits two computers to share one parallel device, like a printer, or lets one PC select between two parallel devices, such as a scanner and Zip&reg; drive. Fully automatic when 2 PCs share one parallel device. Works with parallel printers, scanners, Zip&reg; drives, or almost any IEEE 1284 parallel device. Includes software for automatic printer selection in Windows&reg; 95, 98, and NT. 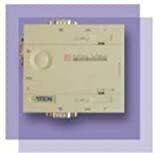 Includes 6-foot IEEE 1284 male-to-male switch cable. Fully electronic design makes it 100% safe to use with any parallel printer. Supports all IEEE 1284 bi-directional communication modes. Special file transfer function between two PCs included. LED indicators for port connections. Easy setup, I received this package and was eagerto install. Sharring a printer. One thing to mention it does require on regular printer cable and TWO male to male cables to hook two pc's up to one printer. So order an extra cable with it. Easy set up again, didn't have to install any HW for the printer. Seems to take jobs very fast. It works like a champ.No need to install the (optional) software, no need to plug it in-- just hook up the cables and you're good to go.You just press a button to switch between the two devices. Only thing to know is that there's nothing "automatic" about this-- you need to do the switching yourself.The word "automatic" refers to another way you can use this switch-- to hook two PCs up to a single device.I don't need this capability, so I haven't tried it.